The Quarters has a modern, fully fitted kitchen, and if there’s a willing cook in your party or family – plenty of pans and casserole dishes are readily available. Don’t fancy cooking? 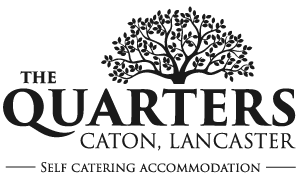 Don’t panic, there’s a wealth of great eateries close by in the Lune valley. We understand that you may have been on a long journey to reach us, and we want you to relax from the moment you walk through the door. To help with that, no matter what time you arrive, and no matter how long you’re staying with us, we make sure that on arrival there’s a fresh pint of milk in the fridge, tea and coffee in the cupboards – and for our older guests – a bottle of wine.